Next to wax, oil finishes are the easiest to apply. But there's more to applying an oil finish than simply wiping it on and off. Here are a few tips to help you achieve the best oil finish possible. Because oil finishes tend to magnify flaws, the surface must not contain bruised or torn grain areas, or they'll be obvious when the finish is applied. Sand the surface to at least 600-grit. If your turning is a gallery-quality piece, sand to 2,000-grit. After each grit change, reverse-turn and sand in the opposite direction. When you've completed sanding with the final grit, lightly wet the surface of the wood, to raise the grain. When dry, re-sand to remove this. Remove any sanding dust or grit lodged in the pores, using compressed air or a tack rag. white spirit and closely examine the surface. If you find an area that needs attention, re-sand and prepare the surface for finishing as stated above. Apply the first coat of finish in a flood, and keep the surface wet for three to five minutes. Pay close attention to areas that absorb more finish and look dry. Re-apply finish where necessary, to ensure the surface stays wet during the rubbing-in. If you are using a polymerised oil finish, the application time may be significantly less. After the first rub-in, use two pieces of kitchen paper - one in each hand - to remove any excess finish. Pay attention to accumulated oil in areas of detail, such as textures or beads. A short blast of compressed air here will help remove any excess finish. Watch for possible bleed-out of the finish from the wood pores and remove any that appear before it cures. Some large-pored timbers, such as oak, walnut and ash, are prone to bleed-out. This may occur for up to four hours after the finish has been applied, depending on the species and amount of finish applied. Before applying the second and subsequent coats, lightly sand the surface with the finest sandpaper or wire wool. Some turners prefer to wet sand at this point, especially when working past 1,200-grit. When you've applied your final coat of finish, let the surface fully cure. At this point, you can use a cutting compound, or go straight to the buffing wheel to smooth and perfect the finish. If you have wet-sanded the previous coats, use a deluxing compound to perfect and polish the final coat. If buffing the piece, charge your wheel with Tripoli or White Diamond compound to increase the effectiveness of the buff. Most oil finishes also respond well to 'dry' buffing with plain cotton or flannel wheels. The buffing speed depends on factors such as the type of finish, compound used and the structure and content of the buffing wheel. If you are a novice, start at 1,750 rpm. If this proves inefficient, gradually increase the speed until the buff cuts effectively. If you want to use highly-polymerised oils on the lathe, you must pay attention to applying very thin, even coats. Less is more in this respect! Kitchen papers can be used with some of the thinner polymerised oils, but are ineffective with highly-polymerised products. Their higher viscosity requires the best of applicators. 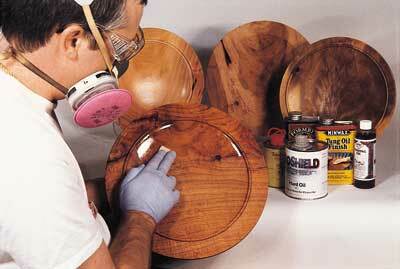 Fine-grade varnish brushes can be used, but need extra-effort to clean and properly store. Because much of my work with these oils is high-speed production finish work, I wanted an easier and less time-consuming applicator than brushes. A synthetic applicator pad made to apply oil finishes to floors without streaking, seen in my local suppliers, was just what I was looking for! The pads are very inexpensive (about Â£2 each) and can be cut to make several mini-applicator pads. Flecto Varathane makes my orange-coloured pad. I cut it into 25mm (1in) wide strips. Before using the pads with any finish, you must remove any loose fibres that may be present. To do this, thoroughly rinse the mini-pads in mineral spirits or white spirit and allow them to fully dry. Then run a high-tack adhesive tape across the surface and sides of each pad, several times. This will remove remaining loose fibres which would otherwise compromise the quality of the finish. The mini-pads are now ready to use. Lightly dip the pad into your finish and apply it to the surface as the piece is spinning. Rapid strokes across the surface will produce a streak-free finish. The pads also work well for applying oil finishes by hand. When you've finished working, rinse the mini-pad in the recommended solvent. The Robson Family's Tried & True line of polymerised linseed oil finishes, don't recommend that you use solvents to thin their products. Instead, they recommend using a thinner product in their line to reduce the viscosity of the thicker product. For example, they recommend using their Danish oil to thin the thicker varnish oil. To use the mini-pads with extremely viscous products like Robson's varnish oil, lightly load the pad with the thinner Danish oil. Remove any excess and then load the pad with a small amount of the thicker varnish oil. Apply to the spinning timber at a reduced speed until the surface has been uniformly covered. Switch to a higher speed and level the finish by moving the pad across the surface at a rapid rate. If your turning contains sharp fissures or bark inclusions that have open edges, don't use these mini-pads for high-speed application! The sharp edges will pull fibres from the pad while the piece revolves, which will contaminate the finish. In these cases, apply by hand. I tested in three stages. In stage one, the finishes were applied to wooden dowels 35 x 250 mm (1 3/8 x 9 3/4in). The surface of the bare dowel was sanded to 600-grit and was burnished with 0000 wire wool. Before each subsequent coat was applied, the surface was again cut back with wire wool. The final finish was buffed with a cotton wheel to perfect the surface. 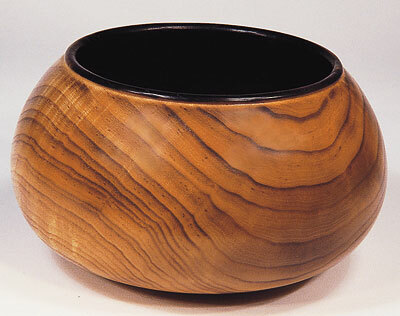 In stage two, the finishes were applied to various turnings, including bowls, platters, weed pots and hollow forms. The finish surface was cut back between coatings with 0000 wire wool. The final finish was buffed with a cotton flannel wheel to smooth and perfect the surface. In stage three, I carried out a thin film polymerisation test. Each finish was uniformly applied in a very thin layer to a sheet of glass. The cured film was then inspected for film colour, resistance to scratching and lustre level achieved. Timbers used in the test included white ash, honey mesquite, black walnut, bigleaf-maple burr, sycamore, black ash, winged elm, silver maple, English-brown-oak burr, pecan, persimmon, mulberry, Nigerian ebony and ambrosia maple. Test results are listed alpha-betically, by manufacturer/stockist name. Rankings are based on my opinion of overall performance in a production environment, as well as the visual and tactile quality of the finish produced. Many of the oil finishes in this test will 'build' to a higher lustre with multiple applications. References to lustre levels achieved are based on three coats of finish. For a complete listing of ingredients, refer to manufacturers data or MSDS sheets in the USA, COSHH sheets in the UK. Drying times shown will vary by amount of application, ambient temperature, airflow and relative humidity. 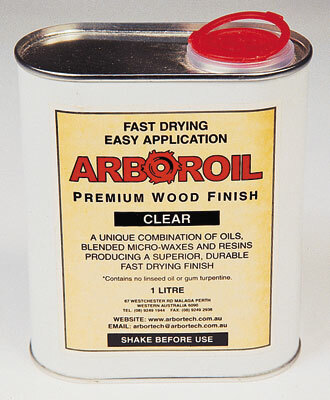 ***** Arbortech PTY Ltd. Arboroil is a superb new fast-drying oil and wax finish that contains ultraviolet inhibitors, modified polymerised resins, urethane resin and a special blend of highly-refined, semi-synthetic waxes that produces a finish similar to Danish oil. The wax quickly migrates to the surface of the timber after application. Buffing the wax produces a high-gloss lustre. A built up finish can be achieved by using a wet-on-wet application method. Time to recoat - 12 hours. Contains White Spirit and aliphatic hydrocarbons. No linseed oil or gum turpentine. Tested colours: Jacobean, Red Mahogany, Light Brown, and Straw. *** Bioshield No1 Primer Oil is a thin penetrating primer/sealer finish containing linseed oil, isopar, orange-peel oil and essential oils. Time to recoat - six to 12 hours. When used by itself, it produces a matt lustre. Liquid colour, clear light amber. **** Bioshield No2 Herbal Oil Primer/Sealer is a blend of organic cold-pressed linseed oil and essential oils. 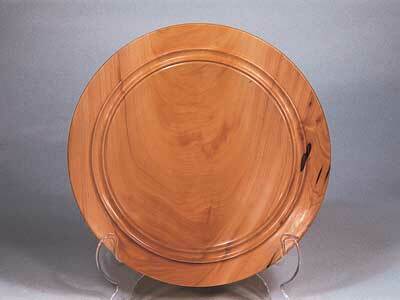 It is recommended for use with food preparation areas like cutting boards and produces a soft matt lustre. Contains no solvent. VOC = 0 g/l. Time to recoat - 12 hours. Liquid colour, clear light amber. ***** Bioshield No7 Transparent Wood Glaze This high-solids, transparent UV topcoat is a blend of linseed oil, tung oil, colophonium, castor oil and orange-peel oil. It provides essential UV (ultraviolet) protection for wood surfaces that are not exposed to wear via titanium dioxide pigments. Time to recoat - 12 to 24 hours. Contains balsamic turpentine and ethanol. Three coats are recommended for optimal UV protection. Liquid colour, light honey cream. ***** Birchwood-Casey Tru-Oil is a fast-drying blend of dicyclopentadiene-soya copolymer and modified linseed oil which produces a magnificent high-gloss lustre. This finish will not cloud or yellow with age and it is highly water resistant. This finish should be applied in very thin coats. Contains mineral spirits. Volatiles = 55 - 60%. Time to recoat - 12 hours. Liquid colour, light amber brown. 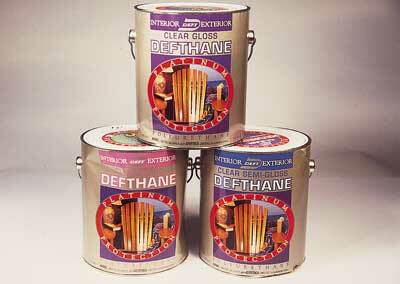 **** Craft Supplies USA Urethane Oil This blend of urethane resins and oils, is food-safe two weeks after curing. It produces a rich-satin-gloss lustre and works well for high-speed applications. Liquid colour, clear, medium amber. **** Daly's Wood Finishing Products' Ben Matt Tung Oil Finish is a superb blend of tung oil, linseed oil and urethane resins that produces a splendid satin lustre. Contains mineral spirits. VOC = 550 g/l. Volatiles = 70%. Liquid colour, clear slight amber. ***** Daly's ProFin is a superb urethane and alkyd resin finish which dries hard and fast. This finish works well in high-speed applications. Contains mineral spirits. VOC = 550 g/l. Volatiles = 70%. Colour, pale yellow. Tested lustre, gloss. ***** Daly's SeaFin Super Spar Varnish with UVA This is a phenolic alkyd marine varnish finish with ultraviolet inhibitors. Contains mineral spirits. VOC = 450 g/l. Volatiles = 55%. Liquid colour, amber. Tested lustre, high gloss. *** Daly's SeaFin Teak Oil This is a blend of tung oil, with alkyd and urethane resins that produces a soft satin lustre. Contains mineral spirits. VOC = 550 g/l. Volatiles = 70%. Liquid colour, slight amber. **** Deft - Classic Danish Oil Finish, Deftoil is a fast-drying blend of linseed oil and tung oil, with urethane and alkyd resins that provides a water-and-alcohol-resistant satin-gloss lustre. Time to recoat - 1 hour. Contains petroleum distillates (mineral spirits, naphtha, xylene and others). VOC = 550 g/l. Requires one week's curing for full water resistance. Volatiles = 60%. Tested colours, Dark Walnut, Medium Walnut and Clear Natural. **** Deft Deftoil (low VOC version) is a fast-drying blend of linseed oil and tung oil, with urethane and alkyd resins that provides a water-and-alcohol-resistant satin-gloss lustre. Time to recoat - 1 hour. Contains petroleum distillates (mineral spirits, naphtha, xylene and others). VOC = 350 g/l. Requires one week's curing for full water resistance. Volatiles = 40%. Tested colours, Dark Walnut, Medium Walnut and Clear Natural. 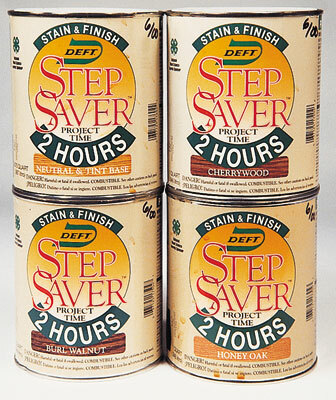 *** Deft StepSaver This blend of linseed oil with polyurethane and alkyd resins, produces a satin-lustre finish. Contains mineral spirits and naphtha. Time to recoat - 12 hours. VOC = 350 g/l. Volatiles = 36%. Tested colours - Burl Walnut, Cherrywood, Neutral Tint and Base, Honey Oak. ***** Deft Defthane Polyurethane This is an oil-modified urethane varnish with alkyd resin that produces a durable, non-toxic finish when cured. Contains mineral spirits and naphtha. Time to recoat - 12 hours. Tested colour and sheen - Clear gloss, clear semi-gloss, clear satin. VOC = 450 g/l. Volatiles = 50%. The finish has been used on the USA Space Shuttles for more than 10 years. Liquid colour, clear light amber. ***** Deft Defthane Polyurethane (low VOC version) is a high-solids oil-modified urethane varnish with alkyd resins (low VOC version) that produces a durable, non-toxic finish when cured. Contains mineral spirits and naphtha. Time to recoat - 12 hours. Tested colour and sheen - Clear gloss, clear semi-gloss, clear satin. VOC = 350 g/l. Volatiles = 37%. It too has been used on Space Shuttles for more than 10 years. Liquid colour, clear light amber. 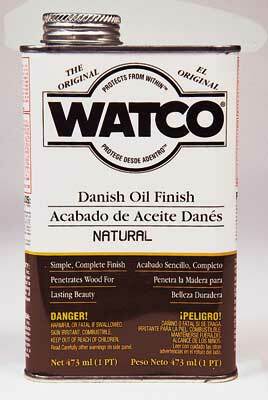 *** Flecto Coatings Ltd's Watco Danish Oil Finish, Natural This Danish oil/ varnish blend produces a rich satin lustre. Time to recoat - eight to 10 hours. VOC= 550 g/l. Contains mineral spirits. Liquid colour, clear amber. Liquid colour, slight amber. ***** General Finishes' Arm-R-Seal, Gloss is a superb blend of tung oil, with alkyd and urethane resins that produces a high-gloss lustre. Contains Stoddard Solvent (mineral spirits). Time to recoat - four to six hours. Volatiles = 63%. Liquid colour, medium amber. *** General Finishes' Prelude Butcher Block Oil This pure mineral oil finish is food safe and non-toxic. Liquid colour, clear. **** General Finishes' Royal Finish, Satin is a blend of tung oil and urethane resins, produces a rich satin-gloss lustre. Contains Stoddard Solvent (mineral spirits). Time to recoat - four to six hours. Volatiles = 62.5%. ***** General Finishes' Salad Bowl Finish is a 'non-toxic-when-cured' finish that produces a satin lustre. Contains petroleum distillates. Time to recoat - six to 12 hours. Safe for food use after 72 hours and for use in the dishwasher, per the manufacturer. Volatiles = 68%. Liquid colour, clear light amber. 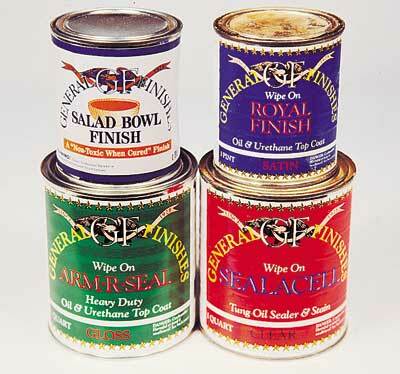 *** General Finishes' Seal-A-Cell, Clear This is a thin blend of tung oil and modified linseed oil with alkyd and urethane resins that is used as an initial sealer coat. When used by itself, it produces a soft-satin lustre. Contains Stoddard Solvent (mineral spirits). Liquid colour, clear, slight amber. ** Kleenstrip Boiled Linseed Oil is a traditional boiled linseed oil finish. Liquid colour, medium amber. **** Lee Valley 100% Pure Tung Oil This is a pure tung oil finish with no added driers or thinners. It has been heat treated to prevent premature gelling. It produces a soft matt lustre that is non-toxic and food-safe. The resulting finish offers high water resistance and is also resistant to alcohol, heat and food acids. Time to recoat - 24 to 48 hours. Liquid colour, clear amber. **** Lee Valley 100% Pure Walnut Oil is a non-toxic walnut oil finish resists alcohol and water when cured. Time to recoat - 24 hours minimum. Liquid colour, clear, very light amber. ***** Lee Valley Polymerised Tung Oil Sealer This superb thinned polymerised tung oil finish contains petroleum distillates (mineral spirits) to allow better first-coat penetration. When used by itself, it produces a rich satin-gloss lustre. Excellent for high-speed application. Time to recoat - eight to 24 hours. Liquid colour, clear amber. ***** Lee Valley Polymerised Tung Oil, High Lustre is a magnificent polymerised tung oil finish that produces a rich high-gloss lustre. Contains petroleum distillates (mineral spirits). The finish produced is very provocative and sensual with excellent grain enhancement. Time to recoat - 8 to 24 hours. Liquid colour, clear amber. ***** Liberon Waxes Ltd's Finishing Oil is a superb blend of pure tung oil with other oils and resins, which produces a rich, glowing, magnificent gloss lustre. The finish is resistant to heat, water, alcohol and food acids. Contains aliphatic solvents (white spirit). Safe for toys per EN71, Part 3. Time to recoat - five hours minimum. Volatiles = 50%. Liquid colour, clear light amber. 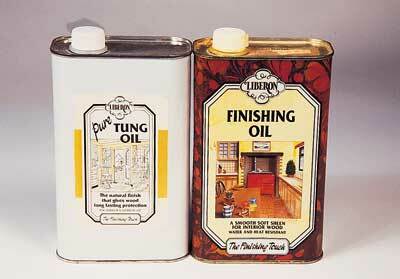 *** Liberon Pure Tung Oil This 'pure' tung oil finish does not contain driers or solvents. The resulting matt finish is food-safe and non-toxic with high resistance to water, alcohol and food acids. Time to recoat - 24 hours. Liquid colour, clear amber. ***** Livos Phytochemistry's Ardvos Oil is a superb blend of PFCP (Pesticide Free, Cold Pressed) linseed oil, natural resin ester, orange-peel oil, linseed stand oil and other natural oils with microwax. This produces a rich satin-gloss lustre that is water-resistant, non-toxic and food/toy safe per DIN EN 71, Part 3. Time to recoat - 12 to 24 hours. Contains isoalipahtes. Liquid colour, medium brown honey. for toys per DIN EN 71, Part 3. Time to recoat - 12 to 24 hours. Contains isoalipahtes. Liquid colour, dark amber. ***** Livos Phytochemistry's Meldos Natural Resin Hardening Oil is a superb blend of (PFCP) linseed oil, linseed stand oil, natural resin ester and organic orange-peel oil. The finish produced is water resistant with a rich satin lustre. Suitable for toys per DIN EN 71, Part 3. Contains isoalipahtes. Liquid colour, clear, light honey. Next time I'll complete the test table, write about layering different oils for grain enhancement, and give manufacturer/stockist details. "Before using the pads with any finish, you must remove any loose fibres that may be present"